Parents & families, an incident involving police activity occurred on Aviation Blvd. between El Segundo Blvd. and Rosecrans Blvd. near the 360 housing development around 10:00 am this morning. Upon hearing this, we immediately went into a soft lock down and contacted the police. They shared with us that the suspect was already in custody and that we were cleared from lock down. We will ensure there is additional staff presence at the dismissal of summer school today at noon. Class of 2017 Antioch University Transcripts have arrived! DVD Class of 2017, if you are awaiting an Antioch Transcript to send to your college, they have finally arrived today. Please come any day, Monday-Friday, between 7:30 am and 3:30 pm in the summer to pick yours up. Remember, you should mail it out no later than June 29 to ensure a July 1 arrival. Class of 2017: If you are a student attending a Cal State or UC college in the fall, and if you listed your Antioch college courses on your application, your college is expecting to receive your Antioch transcript. Antioch shared they would mail them to the DVD front office but they have NOT arrived as of today, Monday June 26, 2017. 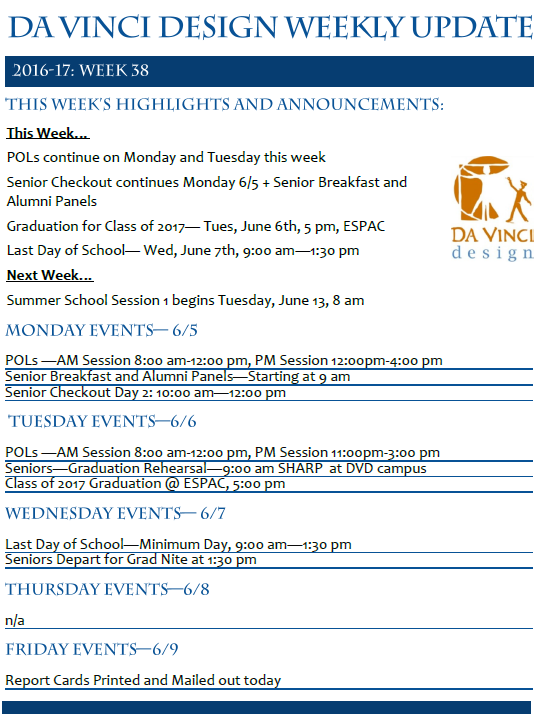 Please note – your Da Vinci Design final transcripts WERE sent out two weeks ago by your counselors. 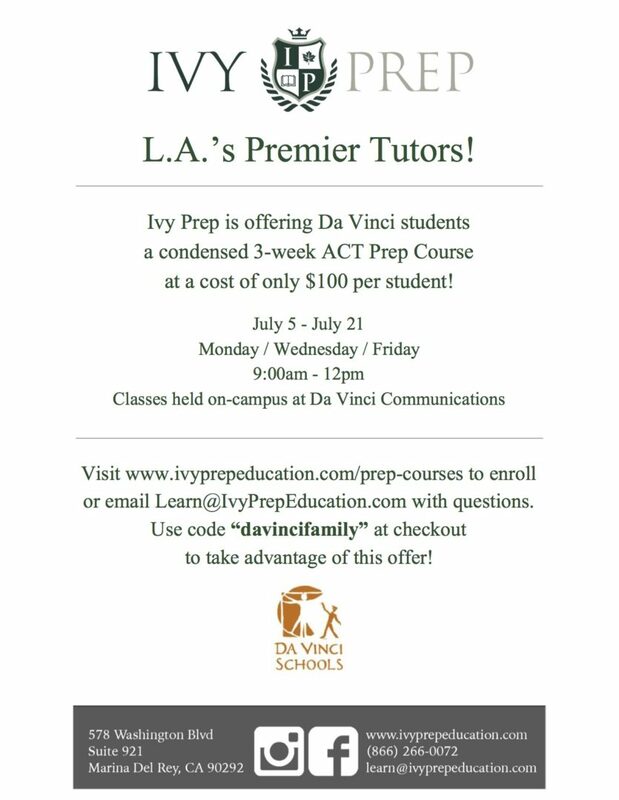 Contact the admissions office at your college and tell them that you were enrolled in a college program at your high school campus (Antioch University) and the transcript they have sent to Da Vinci Design has not arrived yet. Let them know you will be able to pick it up from DVD upon their arrival (hopefully this week!) and mail it to them once you do so. You can go to the Antioch University LA office in Culver City and pick up a copy of your transcript and mail it to your school by no later than Thursday, June 29 so that it arrives by July 1. Designers, tomorrow is the last day of school for the 2016-2017 school year. We have a minimum day for all students running from 9:00 am – 1:30 pm. If you are in need of recovering credit and are enrolled in summer school, Session 1 summer classes begin on June 13 and run from 8:00 am-12:00 pm daily until June 29. Session 2 runs from July 5-July 21. Many of you have already received a form from your counselors and need to turn them in as soon as possible. As outlined in the registration form, uou are not allowed more than one absence (or three tardies, as 3 tardies = 1 absence). Congratulations, Class of 2017! We look forward to your graduation this evening! Designers, the last week of school for the 2017-18 School Year has arrived! Congratulations on completing Week 1 of POLs, we are continually impressed with the amazing work all of our students do. We are so excited to celebrate the Class of 2017 and their graduation this coming week on Tuesday, June 6 at 5:00 pm at El Segundo Performing Arts Center. 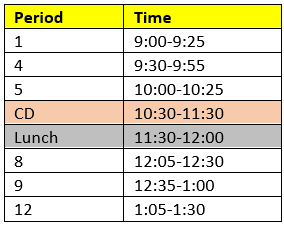 School will run from 9:00-1:30 on the last day of school. 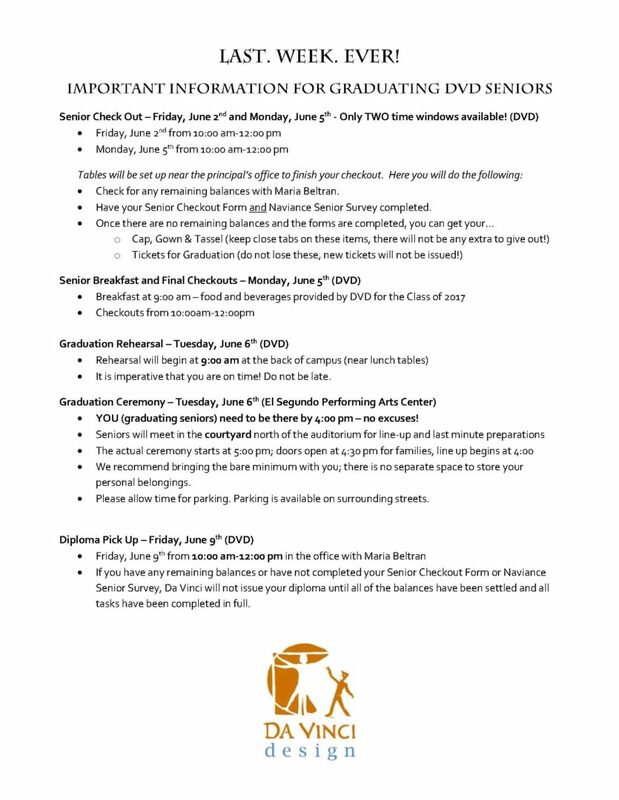 Seniors and senior families, please review the attachment below carefully.